Has anybody ever seen or heard of the tube or sock that gets placed in the ice hole then infalted to keep the hole open while your gone?Just let the air out when you get back the next day and you are fishing.It seems like a good idea.That way you dont scare shallow water fish away when you drill the hole. I just remembered that I have some old waterbed tubes! I wonder if they would work or if they would stick to the sides and tear. Anyone try anything like that? Yeah, those air tubes are pretty nice, I've seen a couple and they would be great for all of you who have permanent fish houses. I second Matts opinion .. they seem to be a credible product of which I will be trying this year. While I was searching the internet today at work... over lunch of course I came across a new auger Strikemaster is making this fall- see my other post Strikemaster Lazer 224. This got me to thinking, what other 'hot' new items are going to be introduced in the coming months that us icefishermen HAVE to have? Seemed like the Buzzstix were last years 'must have'. Thank goodness I didn't pick up one of those. Anybody care to speculate. How much are they? Will it keep a hole open for longer then overnight? Is there a HSOforum around so we can check them out? They used to be advertised on this site. Can't remember what they were called. Air plugs, Air holes, Air tubes ?? Can't quite remember. Yeah, they will keep a hole open longer than just one night. They would be perfect for your sleeper on Red Lake. I will use a Plumbing test ball made by Cherne Companies located in Hopkins, when in a permanent house. I use these to block off plumbing drain, waste, and vent systems in new homes or remodeling work and pump system with air for tightness. They were called "air plugs" and their HSOforum isn't working. My Grandfather used to put a closed bottomed stovepipe in the ice hole. When we arrived at the lake he'd light a gas-soaked rag which was attached to a clothes hanger. The rag was placed in the pipe to melt the ice......Walla, open hole!!!!!! Caution using the old stovepipe trick above. I've heard they can shoot out of the hole like a rocket. Dave, you are right on the rocket! It was enough for stitches on the chin for someone. The key was to restrain it & let it up slowly. Holding it down with your boot was enough, the slowly lift your foot to ease it up & out. A better method was to fabricate them with a slight taper toward the bottom then braze a light chain to the top. Atach the chain to a hook eye in the floor to hold in place. That way if the hole froze aome you could still put it in after a day of fishing. It's not speculation, but more fact. I recieved the new clam corp 04/05 catalog in the mail yesterday. The have lots of neat new stuff for this year. You can attach their new fish traps to other new fish traps with their new link system. They have a new, 25 lb, wind break ice house. It's not a complete cover house but just a wind break. Not a bad idea and they call it affordable. They also have a new two man out this year, the yukon. Its comparible to the guide but with a deeper, more durable sled and it's also 10 inches taller inside. They also made changes to the seats and added some equipment trays. One more thing, they changed the doors from u shaped doors that hang from the top to D shaped doors that attach on the side. A way to link up your clams. I've been thinking about that for awhile. Hopefully Otter can get in on that action too. Sounds like a great idea. What about Rapala's new Jigging Shad Rap? Just got a prototype of this lure yesterday, and it looks to be another winner on the ice scene. It's somewhat similar to a (Nilsmaster) Jigging Shad in shape, but the Jigging Shad Rap is composed of hard plastic rather than lead, which means it'll fish slower than typical swimming lures. I like this concept-- most ice jigging lures always were a tad heavy-- fished too fast. The lightness of this lure, though, ought to impart a much slower glide-wobble on the fall. 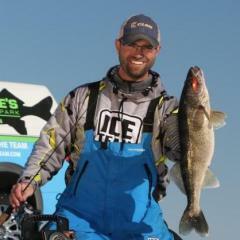 Be fun to see how walleyes react to it. Toad, you've got my interest with that one. I'd also love to see one of those tubes. Maybe I can rig something up along the same line as the tube.